Chris Hughton feels Stoke are a perfect model for Brighton as they look to stay and then push on in the Premier League. The Potters are in their tenth season in the top flight and have also reached the FA Cup and played in Europe during that time. Their best finish has been ninth on three occasions and Hughton admits Stoke are a great example for the Seagulls to look at. 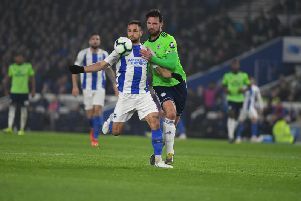 The teams go head-to-head at the Amex tonight, with a 8pm kick-off, and Hughton said: "I remember Tony Pulis doing a brilliant job there but they would have gone through some difficult seasons, certainly in the first few seasons and they've come through it. "Now they're a very, very established Premier League side. Perhaps when you speak at the start of a season and look at potential teams that might go down, they're a club that are generally never mentioned. "That shows the standing of where they are and they're a great example for clubs like ours." Apart from midfielder Steve Sidwell (back), Hughton has a full squad to choose from with Beram Kayal and Sam Baldock back available after injury. Also in the squad will be winger Solly March, who got married during the international break. Hughton said: "He's very young but is a mature young man. We're all absolutely pleased for him, it's unusual these days somebody of his age getting married. "That probably goes back I think, if you look back to the early days footballers generally got married earlier and settled down. "Credit to him, he's been good for us on the football pitch, he's fit at the moment and he's certainly happy in his home life."